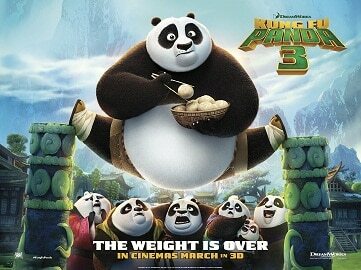 Scheduled to hit the big screen on January 29, 2016, Kung Fu Panda 3 will kick off the release of 2016 best kids movies. But it isn't the only kids movie worth getting excited in the coming year. Here's a list of best kids cartoon movies 2016, which will tell you what you can expect to see over the coming year-2016. Po's legendary adventures of awesomeness continue in the third installment. This time, Po's long-lost father reappears and the reunited pair travel to a secret panda paradise where Po meets lots of hilarious new panda friends. But the good times are interrupted by the evil Kai who sweeps across China defeating all the kung fu masters. To save the day, Po must learn to train his new found friends to become the ultimate band of kung fu pandas. With Jack Black, Angelina Jolie and Jackie Chan all on board, this film must be one of the most expected best kids movies 2016. Now you can get this new kids movie on DVD from Amazon, Redbox or bestbuy, if you haven't watched this funny movie. Tips: Can't wait to see 2016 best movies for children? Hurry to get the best YouTube downloader Mac to free download & watch official trailers of 2016 best kids films. MacX Video Converter Pro - No.1 tool to free download kids movies, including the latest released cartoon movies, animated films, etc, in any resolution (4096p, 2160p, 1080p or 720p) or format (MP4, WebM, FLV). Are you ready to meet the next Disney Princess? 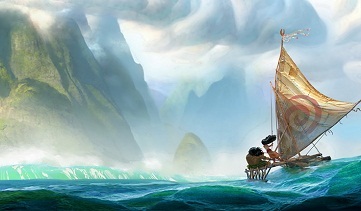 Moana, a spirited Polynesian teenager who sails the South Pacific Ocean to complete her ancestor's quest, discovering the many islands of Oceania on her way. During her journey, she meets the once-mighty demi-god Maui (voiced by Dwayne Johnson) and together they traverse the open ocean on an action-packed voyage, encountering enormous fiery creatures and impossible odds. A fast-talking, scam-artist fox, Nick Wilde goes on the run when he's framed for a crime he didn't commit. His natural enemy, a straight-laced rabbit goes in his pursuit, then the two become targets of the same conspiracy and they have to team up. Let's see if enemies can be friends. The Jungle Book is an all-new 3D comedy-adventure fantasy film adapted from the 1976 animated movie of the same name. Neel Sethi as Mowgli with the voices of Scarlett Johansson, Idris Elba, Ben Kingsley, Christopher Walken and Bill Murray, you already know this is going to be one of 2016 best kids movies you can't miss. The Angry Birds Movie is another great one that cannot miss from the best kids movies 2016 list. It is based on the video game series of Angry Birds. Featuring an all-star voice cast, this film takes us to an island populated entirely by happy, flightless birds-or almost entirely. We will finally find out why the birds are so angry when this animated film hits on big screen. Click to see how to download the Angry Birds movies trailer for preview. This time, the sequel to the 2010 film Alice in Wonderland will find Alice (Mia Wasikowska) return to the world of Underland and discover that things are going very wrong: the Mad Hatter (Johnny Depp) is growing darker. In order to prevent the loss of her friend, Alice turns to Time himself (Sacha Baron Cohen) and goes on a time travel adventure. During this special trip, she encounters younger versions of "the characters we know and love". Can't wait to see! Adapted from a children's book written by Roald Dahl, The BFG tells the story of Sophie (Ruby Barnhill), the Queen of England (Penelope Wilton) and the Big Friendly Giant (Mark Rylance) who set out on an adventure to capture the evil, man-eating giants who have been invading the human world. It's great to see this classic story being given a new lease of life by none other than Steven Spielberg. So never be sorry for listing the new movie 2016 in best list. Ever wondered what your pets do all day when you're off for work? Ever felt guilty about leaving them all alone? The "Humans behind Despicable Me" have investigated what's going on and creates an adorable 3D animated movie featuring all kinds of pets: dogs, cats, birds, rabbits, etc. Comedy superstars Louis C.K., Eric Stonestreet and Kevin Hart lend a few voices. For sure, it's one of the best kids movies 2016 not to miss. Almost 14 years later and 5 films in, the franchise is set to end with the 5th and final chapter Ice Age: Collision Course, picking up where it left off in the last film. No wonder it is one of the best kids movies in 2016. This time, our friends Manny, Sid and Diego will have to overcome all odds after Scrat, once again, causes a catastrophe of epic proportions. This is not a live-action like nearly all of the other films on this list of 2016 best movies for kids but a 3D musical animation based on the big-haired dolls of the 1960s and 1990s. It seems to be fun for us and we learned that Anna Kendrick has been drafted in to play the relentlessly upbeat Princess Poppy for the DreamWorks film. But, that’s the only details we have on it for now. 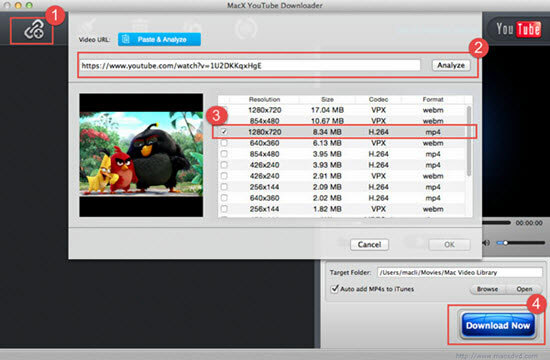 MacX Video Converter Pro is a professional movie downloader which can help you download kids animated movies from Youtube, Facebook, Vimeo, Dailymotion and 1000+ video sharing sites for playback on your Mac/PC. It especially excels at downloading kids movies in HD (720p,1080p and even 4k,5k,8k), providing you superexcellent visual experience. Besides, the kids movie downloader allows you to extract soundtrack from movies and save it as MP3, AAC, AC3, WMA, etc. Downloading is no doubt a nice way to get 2016 best kids animation movies, but there are some other ways, for example, ripping kids movies DVDs. To do this, two conditions are enssiential: kids cartoon movies DVDs and best DVD ripping software. 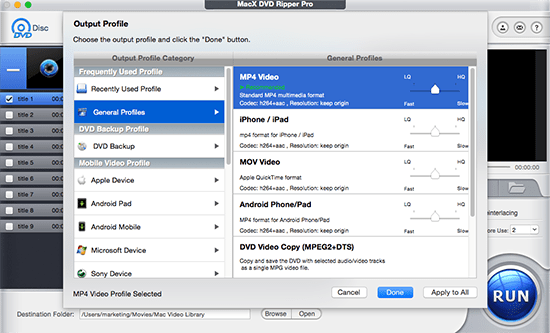 And MacX DVD Ripper Pro is precisely the ideal one beyond all question. It is proficient in ripping any DVD to MP4, MOV, MKV, AVI, FLV etc., bypassing any DVD protections, no matter for the old DVDs or the new releases on DVD. 1. At the very beginning, free download the DVD ripper (or Windows version for PCs) and launch it. Then load your kids movies DVD by clicking "DVD Disc" icon. 2. Choose the output format from the pop up window. MP4 is highly recommended for its wide compatibility of Mac/Windows, iPhone iPad Android devices. 3. Specify the output folder path by click "Browse" button. 4. Press "RUN" button to start ripping DVD movies to MP4.